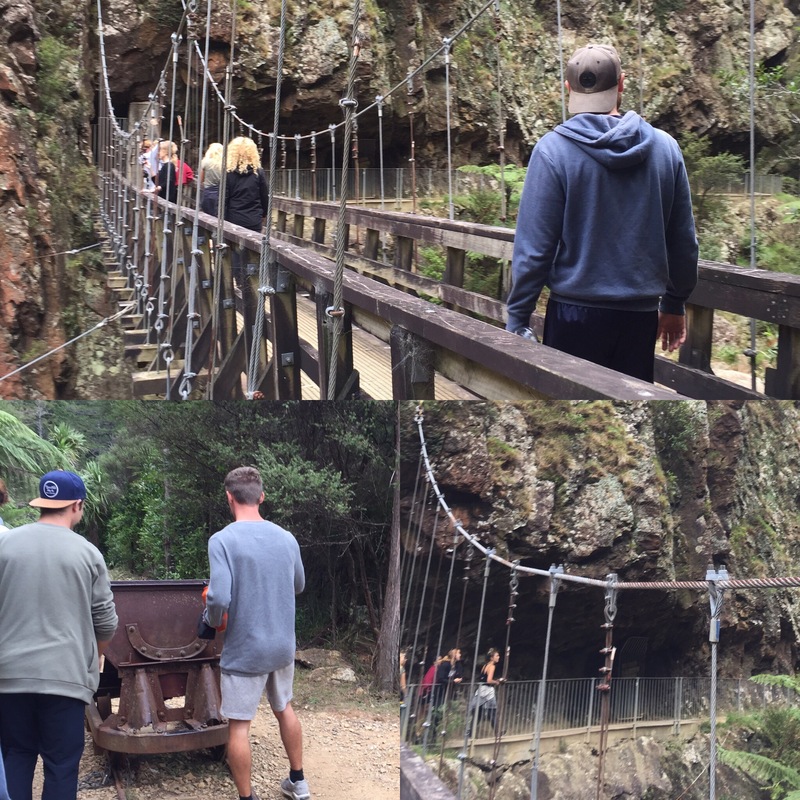 Waitomo was the next stop on our Kiwi Experience exploration of New Zealand. 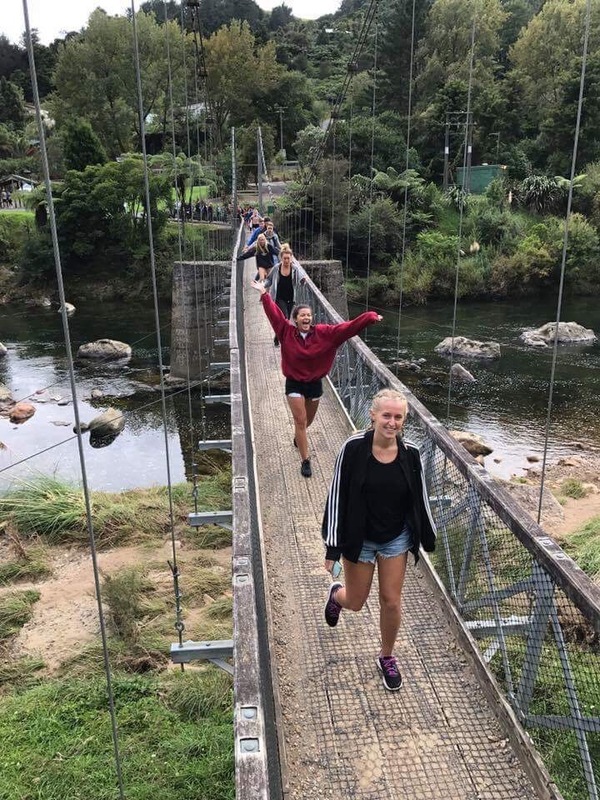 We had to leave at 7:30am because we had quite a distance to cover to get to Waitomo in time to do our main activity of the day – black water rafting. It’s quite nice on the bus because they take you to some other places along the route that you might be interested in to have a little walk around. 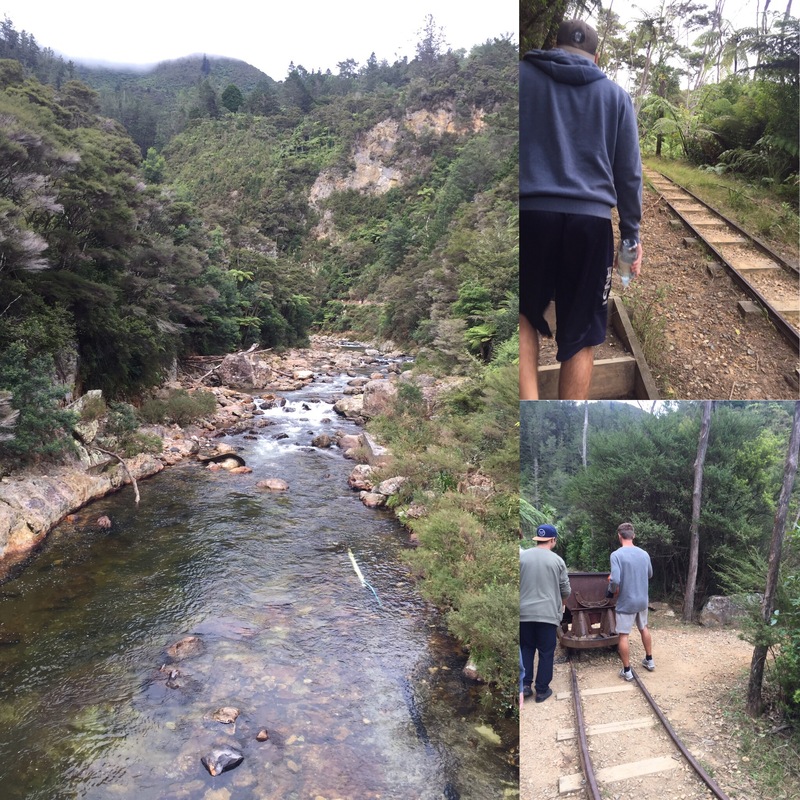 Our stop for the day was to one of the first gold mines in New Zealand at a place called Karangahake Gorge. It was really cool seeing the tracks built into the canyon and the mining cart that would have been used to transport the gold they found. 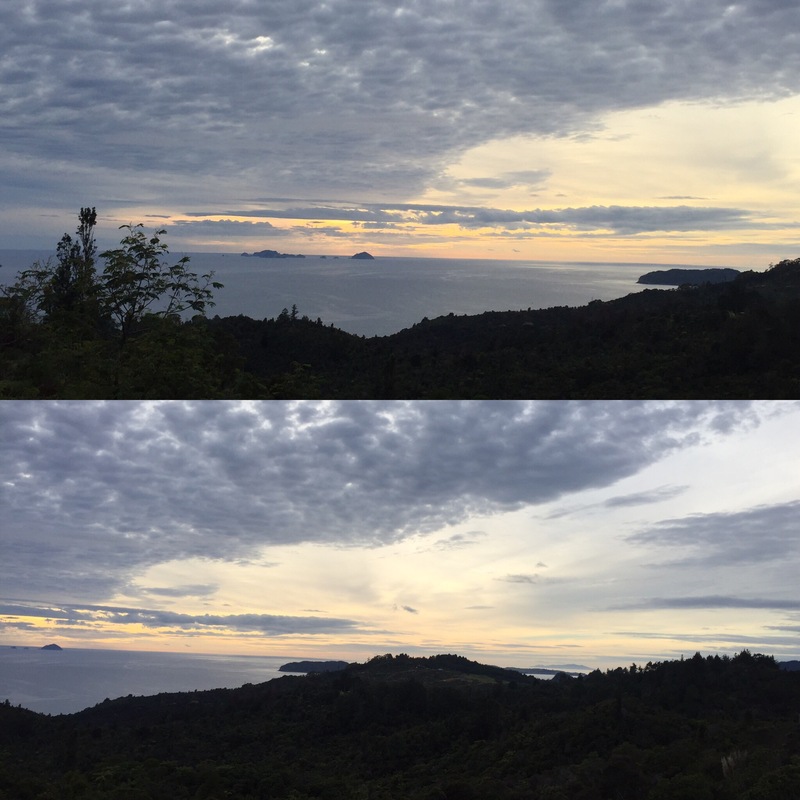 We had never associated New Zealand with gold before so it was really interesting. On the next leg of the journey we got to try a famous fizzy drink from New Zealand because we were travelling through the town (Paereo) where it is from. Our driver, Gina, bought us some to try which was nice of her. The drink was called Lemon and Paereo (L&P) and tasted like sherbet lemons (well that’s what I think) or Sprite (which is what Niall thinks). 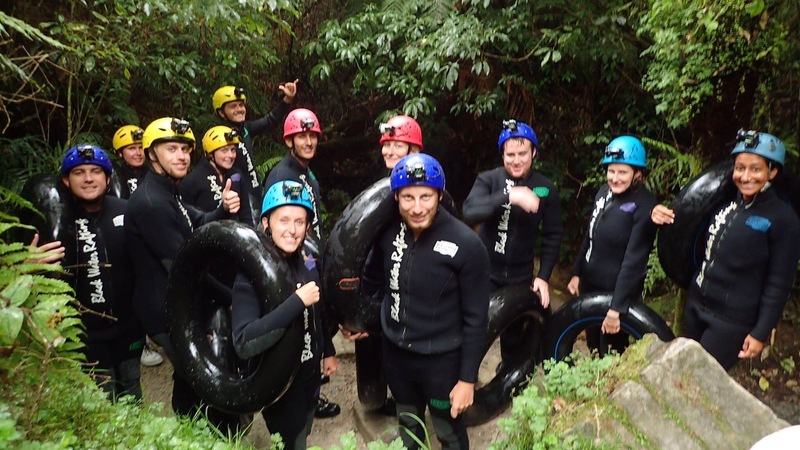 Once we got to Waitomo we got sorted to go Black Water Rafting. Our group had their rafting at 3:45pm and it would last just under 3 hours. 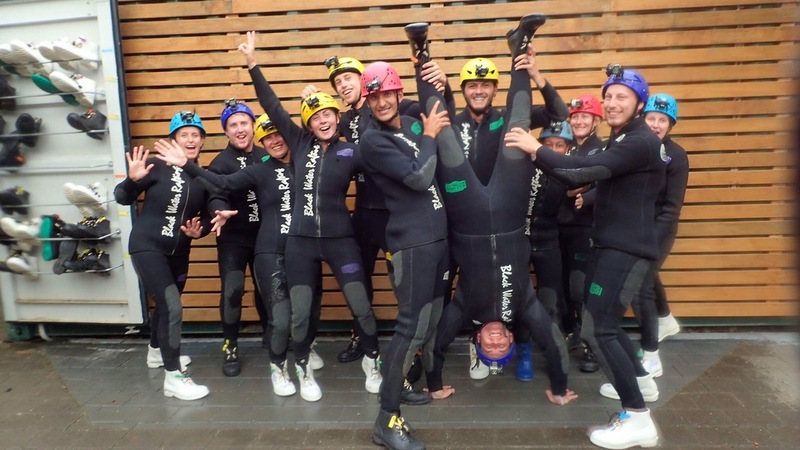 We got put into really thick wet suits, special wet suit socks and some boots (like short wellies) and then given a helmet with a torch attached to it. We then piled into a minivan that took us to the caves. 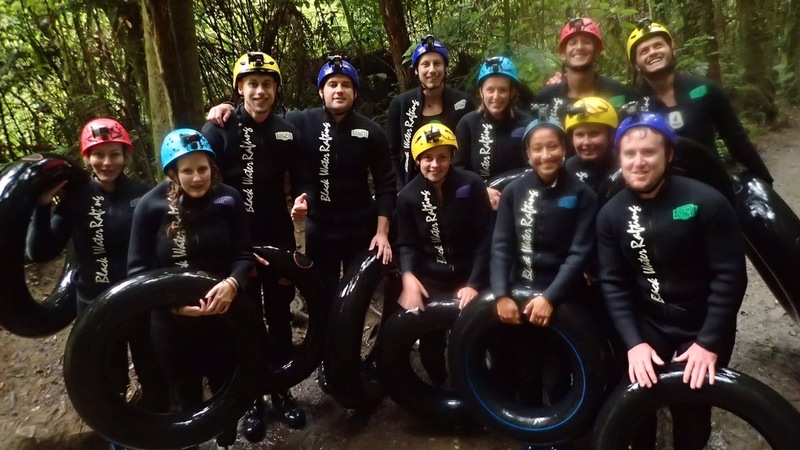 We were given squishy rubber tubes – like the rubber rings you’d have in a water park but with less air in and stronger – and then were told how to jump off a waterfall with the tubes. This was done in the river before we went into the caves. We all had to jump off and the shock of when the water hits you was incredible. The water was absolutely freezing and it took your breath away a bit, especially as impact made the water splash over your head. We then were told how to connect ourselves together like an eel which we would be using for a leg of our journey in the cave later. We had to sit in the tubes and hold onto each other’s ankles so that we made a long chain. 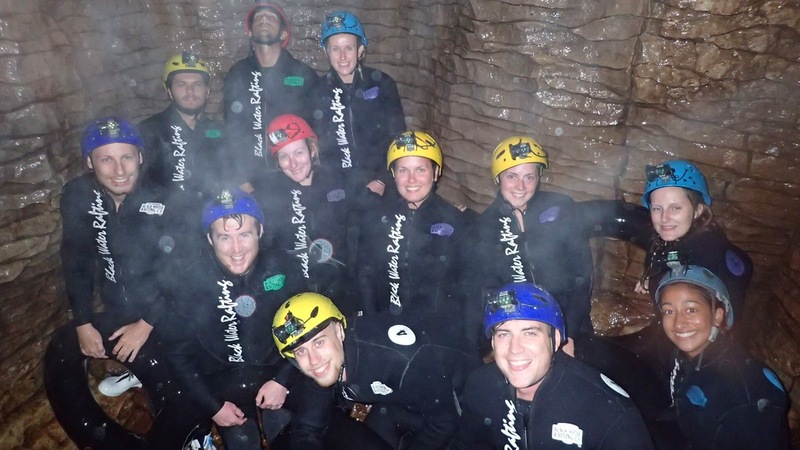 Our caving guide was funny and told us all the ways to notice if the person behind us was facing the wrong way up from their boot (i.e upside down for drowning). After that, it was time to go into the caves. 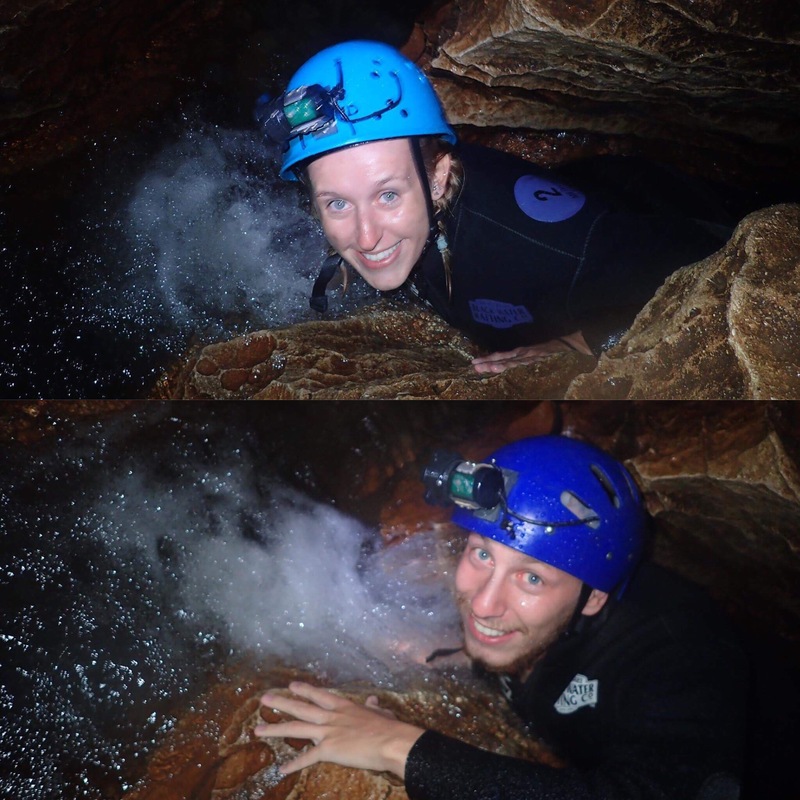 We we’re doing the black water rafting route known as Labrinth and it would involve us getting really wet (there are different options and amounts of time you can be in the cave for). When you first get in you are in a big cavern which is the opening of the cave. This then leads into small tunnels and passageways leading off to different parts of the underwater world. 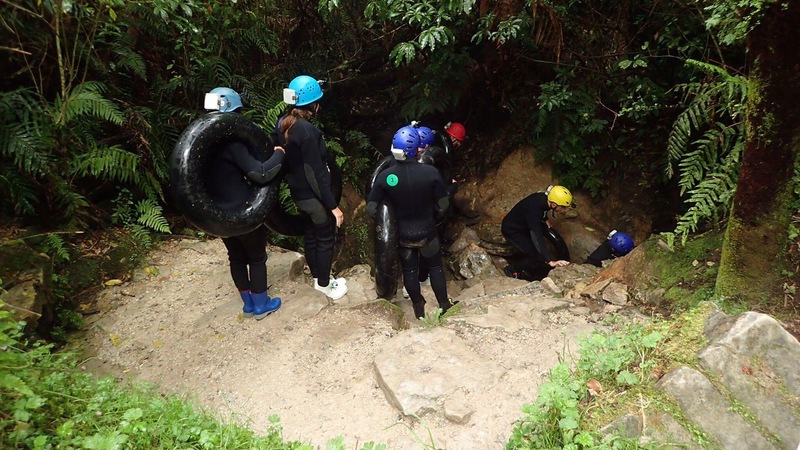 We first went through a tunnel that you have to crawl through which was cool and then grabbed our tubes and headed into a wider tunnel that had a river running through it. The water was actually quite strong and you had to be careful where you put your feet because it could be quite uneven. One of the most amazing parts of the underwater caves were the glow worms. The place was full of them all glowing above you which was really exciting to see. After a lot of clambering over rocks and up ledges (sometimes needing a leg up) we had our first jump over a small waterfall into a deep pool. 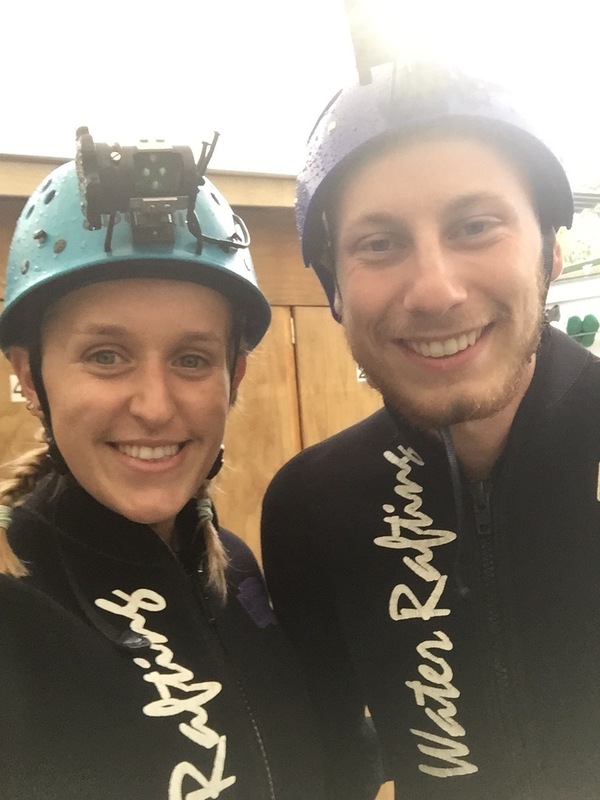 It wasn’t as cold at the first jump had been – probably because we were now acclimatised to it – but was a bit more nerve wrecking because of how dark it was! We had a stop and were given sweets which was a nice surprise and they told us a bit more about the glowworms. We all turned our torches off and sat looking at the ceiling glowing away whilst the guide spoke. We were then traversing through the cave some more and we sent through a very small tunnel that we had to lie on our bellys to get through. I found it quite hard to get out of it without just rolling down into the water! 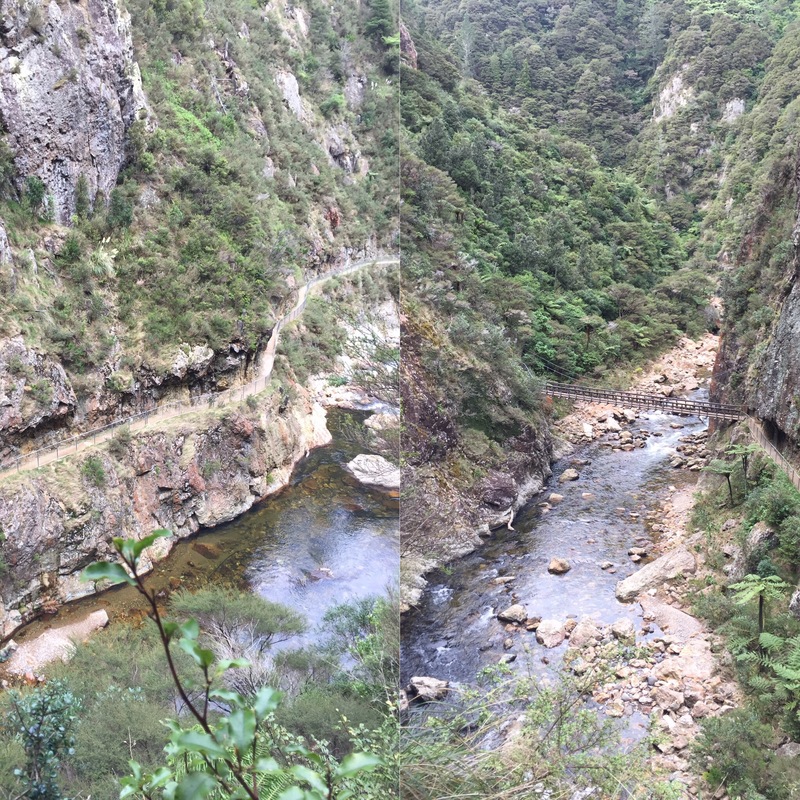 After that, it was time for the second and bigger of the two waterfall jumps. This one had a hole by the top of it and one of the guides threw himself into it to show us how you just disappeared under it, so that it should be avoided as it’s pretty dangerous. We all then went to the edge and jumped off which was really fun. 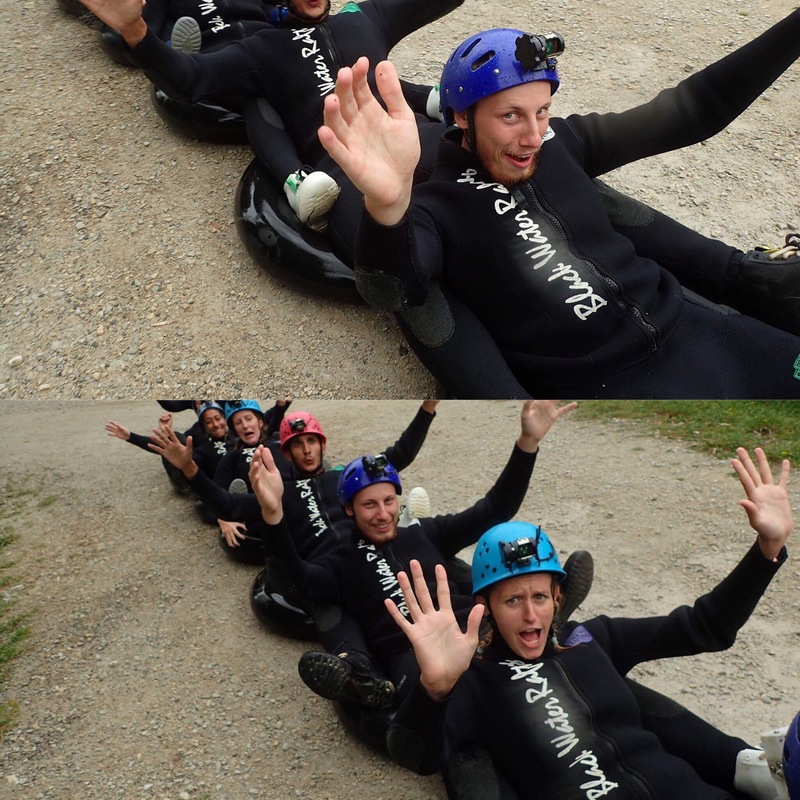 Once we had all jumped in we created our human eel whilst holding onto a rope on the side of the rock. Once we were all connected we turned off our lights and lay back to look up into the cave and see thousands and thousands of glow worms while we glided through the cave. It was just magical seeing the cave lit up like tiny stars whilst being underground – I loved it. We then had to keep our lights off and navigate our way through the underwater river to the end of the cave. It was actually quite hard because your were still sitting in your tube. 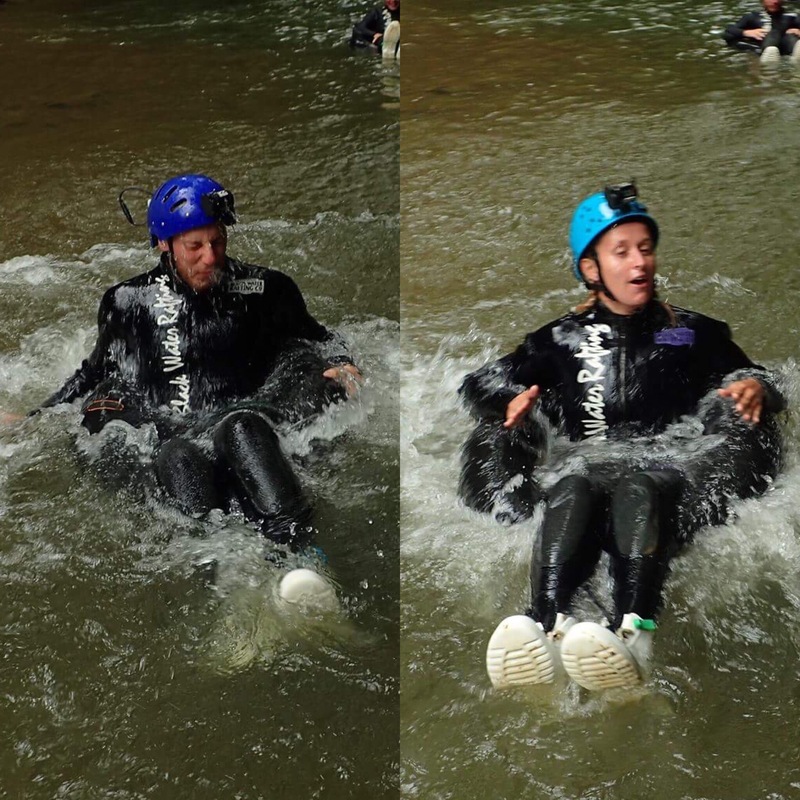 Someone else in our group accidentally pushed me into a crevice so that I got a bit stuck and it caused a pitch black tube jam which was quite funny. 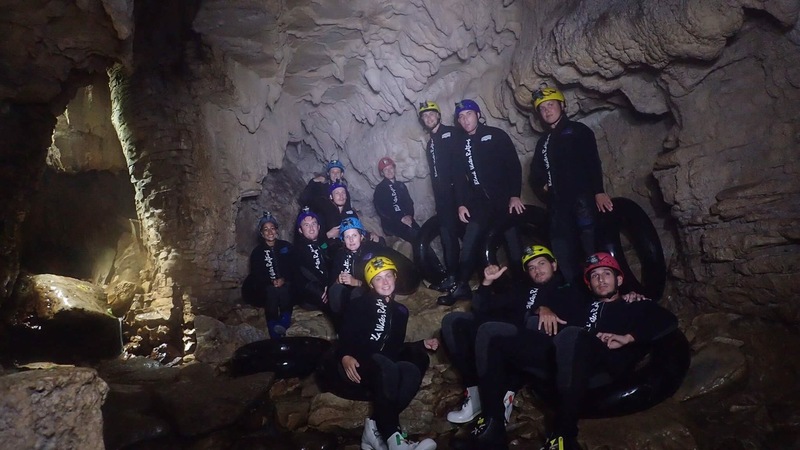 We all had such a good time but we’re glad to get out of the cave because we were getting pretty cold – my hands were super numb. You would be feeling fine and then bend or crouch and water would run down your back or down your arm and it would be really cold! It isn’t something for anyone who doesn’t like small spaces but it was really fun for us so I’m really glad we did it.